New York restaurants for kids and grownups. For some New Yorkers, hearing that a restaurant is "family-friendly" may evoke unappetizing visions of chicken fingers and sticky floors. Though not all New York City restaurants are completely accommodating of tiny patrons, there are many that embrace the whole family, offering interesting ambiance and quality food alongside more juvenile offerings. No babysitter, no problem. Michelin-recommended Schiller's Liquor Bar offers a continental menu alongside seasonal house cocktails and a wine list ranked "cheap" to "good." (The "cheap" selections are reportedly the best.) Kids ages 10 and younger eat free off the kids' menu on weeknights from 5 to 7 p.m. 131 Rivington St., Lower East Side. Rosa Mexicano's three locations (with a fourth planned for Tribeca) combine upscale Mexican cuisine with a festive family atmosphere. Kids can order from a "Young Amigos" menu and try their hand at avocado-smashing at "Rock the Guac" events. Various locations in Manhattan. Habana Outpost, a Fort Greene center for Mexican and Cuban cuisine, calls itself a "community gathering space for families, artists and toddlers." Parents can check out their "Kids Corner" activities schedule, "Baby Breakfast," free outdoor movie nights and "For the Gringos" menu. A huge outdoor patio full of picnic tables accommodates messy children and grown-ups alike. 757 Fulton St., Fort Greene. Restaurant and cafe Fabbrica is five minutes from Smorgasburg on North 6th Street in Williamsburg. It offers contemporary Italian food with a vibe both hipster and family-friendly. On evenings from 5:30 to 7 p.m., for every adult who orders an entree, a kid can receive a personal margherita pizza free of charge. 40 N. 6th St., Williamsburg. Bark updates a classic American burgers-and-hot-dogs menu with meat sourced from local farmers. 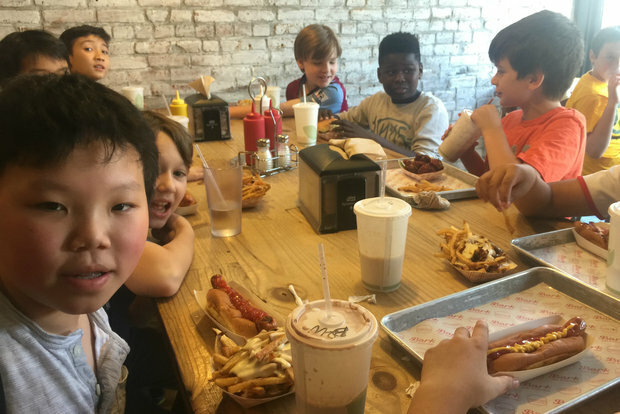 Kids are "such an important part of the business," says co-owner Joshua Sharkey, adding that many children who have never eaten a hot dog are willing to try theirs. 474 Bergen St., Park Slope. Down in Bensonhurst, at L&B Spumoni Gardens, the Barbati family has been serving Italian cuisine for four generations. Menu options include children's entrees and a four-course "family-style tasting menu." Their large dining room and outdoor space offers everyone plenty of room to munch on pizza or slurp spumoni. 2725 86th St., Bensonhurst. Brianna Cano, co-owner of Forest Hills restaurant Twist and Smash'd, describes her fast-casual burger joint as "really geared to families" and children. Signature "twisted potatoes" and customized sandwiches appeal to kids' taste buds, Cano said, while the chalk wall and Connect Four on the back patio keep them entertained. 72-06 Austin St., Forest Hills. Astoria-born burger joint Bareburger serves up pasture-raised meats at locations from Ohio to Toronto. Kids get a "cubby" menu, stroller-friendly seating options, and a vibe relaxed enough to absorb a temper tantrum or two. Adults will appreciate the wide range of organic meats and toppings, plus ice cream and beer. Various locations in Manhattan, Brooklyn and Queens. Located close to the Bronx Zoo, Antonio's Trattoria serves Italian classics with plenty of children's options in a cozy setting, which comes with a singing bartender. 2370 Belmont Ave., Belmont. Over in Riverdale, close to Wave Hill and Riverdale Park, roomy deli Liebman's has been serving Kosher fare since 1953. A family-friendly atmosphere lures guests schlepping in from all over the city. 552 W. 235th St., Riverdale. Lunchbox SI draws inspiration from kids' food classics and comic book heroes, serving sandwiches called "Terminator" and "Captain America" alongside "Tator Tot Towers" and "cereal milkshakes." Kids can request a lunchbox-sized version of any entree complete with fries, a juicebox, and surprise dessert. Kids are "equal opportunity eaters," said owner Jason DiDea. Management "likes to keep it a family environment," said server Tasha Nives. The restaurant provides booster seats and ample stroller space. 1612 Forest Ave., Westerleigh.